rise above Taunggyi once a year. KarmaQuest invites you to travel with us through Burma’s stunning cultural landscape, visiting world-class heritage sites such as Bagan, with its 2,500 stupas spread like jewels on the banks of the Irrawaddy River; Yangon, with its magnificent, gold-embossed Shwedagon Pagoda; the fascinating water world of Inle Lake,where we’ll glide in dug-out wooden boats amidst floating gardens and villages; and Kyaing Tong, where we'll experience village life and visit social service projects that help boost opportunities for women and children through education and empowerment. 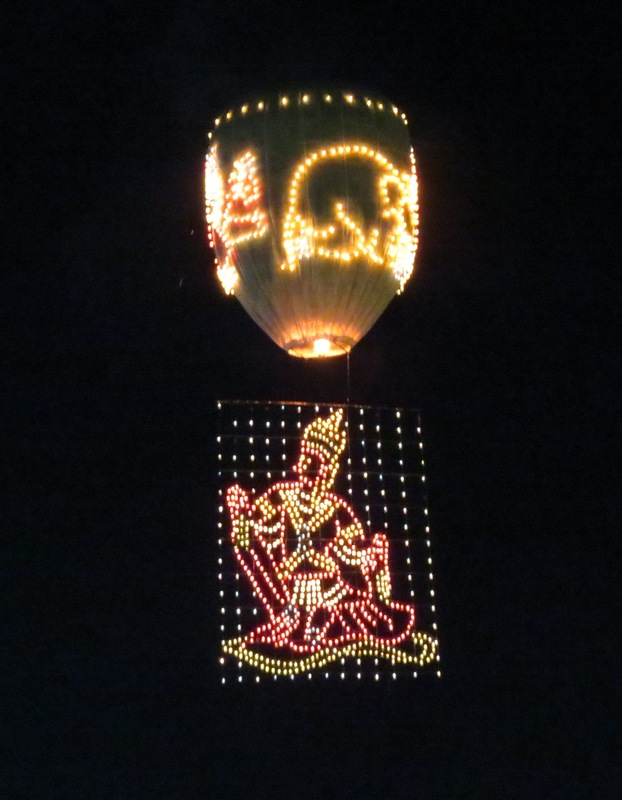 A special treat awaits this year at an annual hot air balloon festival in Taunggyi, where brightly lit and decorated balloons float high above the cheering crowd. We’ll travel by foot, boat, jeep, bus and plane; stroll through colorful markets and take moderate day hikes through Kyaing Tong's hill country to meet village families. Along with these insightful travels, we will visit and learn about KarmaQuest's partners' non-profit educational programs to learn how our donations can help. The trip begins and ends in Yangon. We’d be happy to assist you in planning your travels to and from Burma via Bangkok or other gateway cities; or to help you plan an extended stay in Burma or elsewhere in Southeast Asia. Please inquire about our Extension Trips. Day 1: Arrive in Yangon: Visit Shwedagon Pagoda, the most revered Buddhist temple in Burma: 90 meters tall and gilded with more than 19 tons of gold leaf. We’ll remove our shoes and join pilgrims on a stroll on the well-swept marble arcade. Overnight in Yangon. Day 2: Yangon: We’ll spend the day seeing the sites, including Botataung Pagoda, Pansodan Street with its colonial buildings and sidewalk markets, Wahdan jetty, a lively shipping dock, the National Museum, and China town. Overnight in Yangon. Day 3: Bagan: After flying from Yangon to Bagan, we begin our visit of one of Asia’s most stunning archeological destinations with its more than 2,000 pagodas dotting the plains along the legendary Irrawaddy (Ayerwaddy) River. We'll visit Bagan’s most distinctive pagodas. This evening, we'll enjoy a home-cooked meal with a local family -- unforgettable! Overnight in Bagan. Day 4: Bagan: After breakfast, we'll drive (about one hour) through the Bagan country side to Mt. Popa, which supposedly rose from the ground in a massive earthquake in 442 BC. Mt. Popa is famous as the abode of the Nats (spirit gods) . We'll walk up 777 steps to the top. On the way to Mt. Popa we will visit a toddy farm where home-made hooch is made from palm sugar. Return to and overnight in Bagan. Day 5: Bagan: Today marks an annual festival at Shwezigon Pagoda near Bagan, which we'll attend in the evening. First, we will take a short boat ride on the Ayerwaddy River to an island with typical farms and villages to observe local ways of life. Return to Bagan and later in the day, we'll visit to a small lacquerware crafts shop where you can try your own hand at making some. Then ride by horse cart through some of Bagan’s temple areas, monasteries and villages before joining the festival of Shwezigon Pagoda. Overnight in Bagan. Note: An unforgettable way to view Bagan’s temple-scape is from a hot air balloon! This morning excursion is not part of our tour and must be booked in advance. Please inquire. Day 6: Taunggyi Hot Air Balloon Fesival: Fly to Heho and drive to Taunggyi, the capital of Shan State and a center of agricultural trade with a local market of fresh vegetable, beautiful flowers and colorfully dressed local tribespeople. In the evening, we will go to see the lively competition of hand-made paper balloons as they lift into the sky born on hot air from flames. After a show of fireworks call it a night. Overnight at Taunggyi or Nyaung Shwe. Day 7: Taunggyi – Kakku - Inle Lake: Today we'll drive to Kakku, a phenomenonal site of 2,000 stupas packed closely together and of obvious great spiritual importance to the local Pa-O people. Each one is an individual masterpiece. Then drive to Inle Lake, and boat to our hotel on the lake, an unbeatable location for stunning sunsets and sunrises. Overnight at Inle. Day 8: Inle Lake: Lotus Weavings, Floating Farms and Monasteries: Inle Lake supports a unique way of life on the water. Ethnic peoples build their homes on stilts, and farm on floating gardens. We’ll travel exclusively by boat: today to Phaung Daw Oo Pagoda, containing five sacred Buddha images smothered in gold leaf, then to a village where we see traditional silk weaving and the processing of lotus stems into fabric traditionally worn by monks. We’ll take a boat ride through villages and see the floating gardens up close, then on to Nga Hpe Chaung Monastery, which houses dozens of Shan Buddha images. Overnight at Inle. Day 9: Inle Lake: Market Day and a Village Trek Our first stop is a shopping scene like you've never experienced: the parking lot is packed with long wooden boats laden with farm produce, metal tools, livestock and an unimaginable variety of life's essentials. Wander amidst the stalls, tasting local treats and picking up souvenirs. We'll then boat to a quiet inlet and take a half-day walk through on-land farming villages and rice fields to a Pa O village, where we'll have lunch with a family. Enjoy home-cooked foods and a chance to chat with the family members. Then return on foot to the lake, and motor back to the hotel. Overnight at Inle. Day 10: Kyaing Tong We'll drive back to Heho and fly to Kyaing Tong, a small town set amidst a hilly region of Shan State, known for the many ethnic peoples who live here. The town encircles pleasant Naung Tong Lake with a popular walking trail around its edge. Overlooking the town is a gold-embossed Standing Buddha image, commemorating where Kyaing Tong was founded some 1000 years ago. Enjoy sunset on One Tree Hill where a lone 245 year old tree stands, planted by the founder of Third Myanmar Empire. Overnight in Kyaing Tong. Day 11: Kyaing Tong: Village Visit: Today we'll drive into the countryside and walk a couple of hours to a village that has benefitted from its association with a non-profit organization that KarmaQuest helps support. Here, we'll talk with local residents about how project interventions such as the construction of toilets, water supply and the training of a local woman mid-wife have helped to improve their lives and health. Along the way, we'll encounter women of the Aku and other ethnic groups selling their handicrafts, and will visit a school. Return by foot and drive back to Kyaing Tong to overnight. Day 12: Kyaing Tong to Yangon: In the morning, we’ll visit the central market which bustles with morning transactions in products from China and Thailand as well as traditional clothing and other local items that make interesting souvenirs. Later we’ll visit the Wat Jom Kham pagoda dating to a visit by Gautama Buddha. Later transfer to the airport and fly to Yangon, where we'll overnight at the same hotel as where we started the trip. Day 13: Depart Yangon: The morning is free to explore Yangon on your own: to visit Shwedagon Pagoda once more, to shop at Scott's Market, or to rest up for the journey home. We recommend an afternooon flight time to Bangkok, depending upon your international flight schedule home. Onward flight and hotel arrangements can be made upon request. In keeping with KarmaQuest’s commitment to responsible tourism – tourism that benefits local communities and supports conservation of the natural and cultural environment in the places we visit – your donation in association with this trip will help support educational and women's livelihood programs in Burma.You will visit project sites on the trip, and learn about other ways that you can help.